The route taken by the goods and services from producers to the consumers is referred to as the marketing channel. A channel is usually composed of a number of levels or stages. Each level contains a set of middlemen who perform the functions with the intention to bring the product closer to the point of consumption. 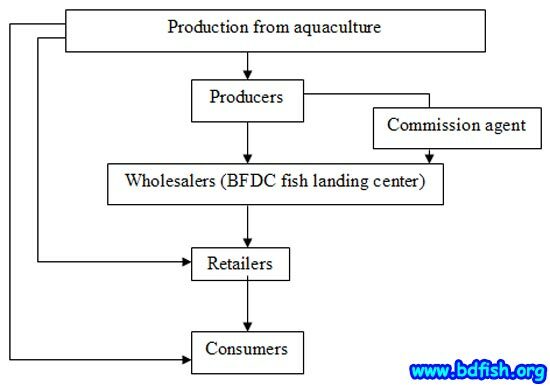 The study of marketing channel is necessary because it has a direct relationship with the availability, price fluctuation of fish items and market system. In Shaheb Bazar indirect marketing channel is dominant where farmers or producers engaged with middlemen in order to channelise their products to consumer. Direct marketing channel is found in small scale in Shaheb bazar fish market where farmers or producers sell their products directly to the consumers without engaging any middlemen. Fishermen are the starting point and as well as the important and basic person of fish marketing channel. 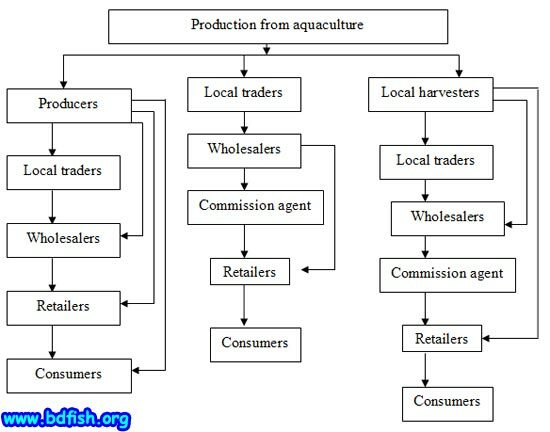 They either cultivated fish in their pond up to at marketable size or harvest fish from other fisheries resources. Cultured species are collected from fish farm, ponds, ditch, canals, dighi mostly and at a little extent large water body such as daha and river (pen and cage culture). 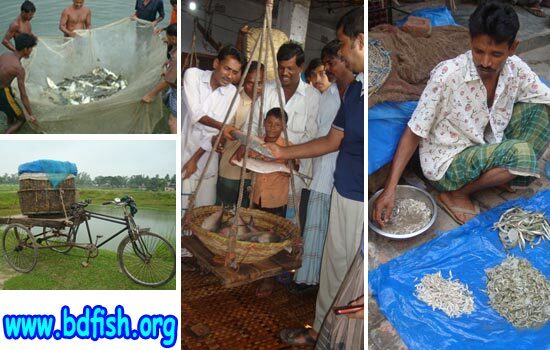 In north-western Bangladesh pond culture is very popular than aquaculture in open water. The capture fisheries mainly come from rivers and beel. Indian major carps, exotic fish species, perch and catfishes are the dominant in cultured in the northern part of Bangladesh. In case of capture fisheries, the fishes are harvested from mainly Chalan beel, Padma river, Mahananda river, floodplains and some other sources. Occasionally exclusive fish items (such Hilsha, Prawns, Coral fish) are transported from distant fish landing center of other districts of the country (Shirajgong, Khulna, Jassore). In case of Hilsha, fish hervesters work on their own boat or operate other people’s (locally known as Mahajans) boat. The boat owners have full control over the fishermen as they have extended credit for the purchase of nets and other fishing equipments. Fishermen tend to sell their catch at the landing centers to suppliers (locally known as Beparies) with the help of commission-based sales agent (known as Aratdars). These merchant middlemen who sell to retailers and other traders in significant amounts but not to ultimate consumers. Products are usually sold in large quantities on wholesale basis. They purchase fish from the Beparies and even from the fishermen directly (Keith et. al., 2003). In case of local producers, by using minimum input or sell their product as fresh condition either directly to the consumers or through any intermediaries. In Shaheb bazaar fish market, faria collect fishes form adjacent regions of the fish markets. The second stage intermediaries are Paikar or wholesaler is a kind of merchant middlemen who sell to retailers and other traders in significant amounts but not to ultimate consumers. Products are usually sold in large quantities on wholesale basis. They purchase fish from local traders and even from the fishermen directly. There is a another group called Aratdar or Commission agents, sell the products of the assembly traders like local traders on a fixed rate of commission as payment for the services rendered by them. In Shaheb bazar local fish markets, Aratdar takes 3-4% commission as payment for the service. The number of Aratdars in Shaheb Bazaar fish market is 12. 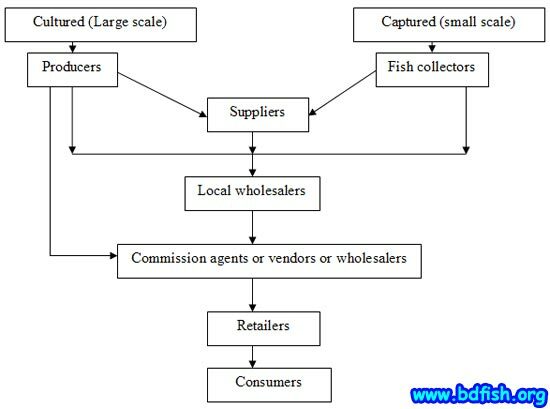 Then the retailers collect fish from Wholesaler or Aratdar and even from the producers or growers with or without paying of advance money. They get less benefit in the marketing system. In Shaheb bazaar, there are about 80 retailers are present. 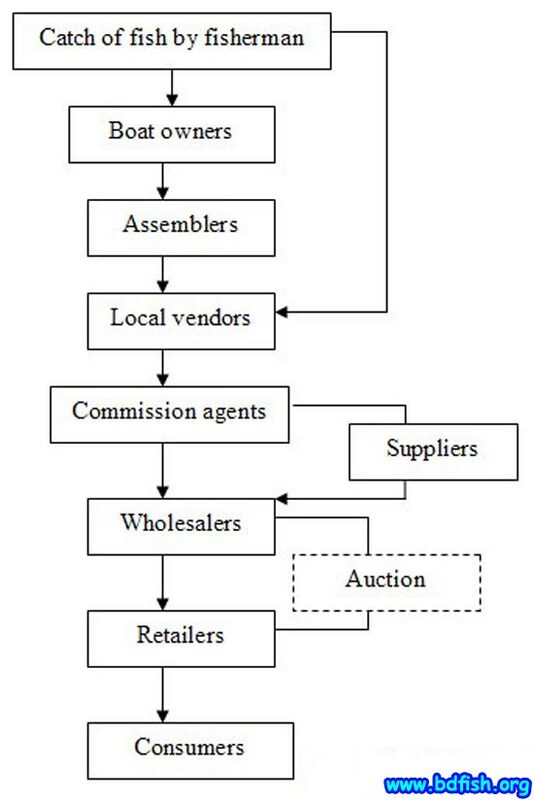 The consumers or customers of fish occupy the terminal position in the fish market chain of observed fish markets. People from different adjacent areas come to these markets for buying fish. Presence of middle class and higher middle class group customers in Shaheb Bazar is comparatively higher and higher numbers of customers are seen because variety and larger types of fishes are common in Shaheb Bazaar fish market. In Laxmipur fish market both long (includes more intermediaries) and short (includes only growers, retailers and consumers) marketing channel is observed. Retailers (35 retailers) dominate the market and marketing channel is short here. The retailers collect fish from the wholesalers of Shaheb bazaar fish market and BFDC fish landing center of Rajshahi New Market. Sometimes, they collect fish from local venders via commission agents or directly from producers. The consumers are local and of higher middle class and middle class group. 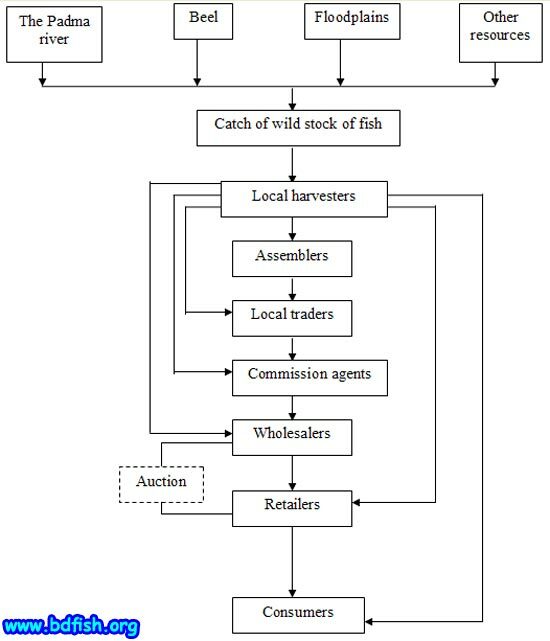 The capture fisheries dominate the market mostly. Outside the market, a number of local collectors directly sell fishes like small prawns, small indigenous species etc to the consumers. Keith, U., K. Alam, R. Dastidar, U. Datta, N. Oudwater and A. Ward.2003. 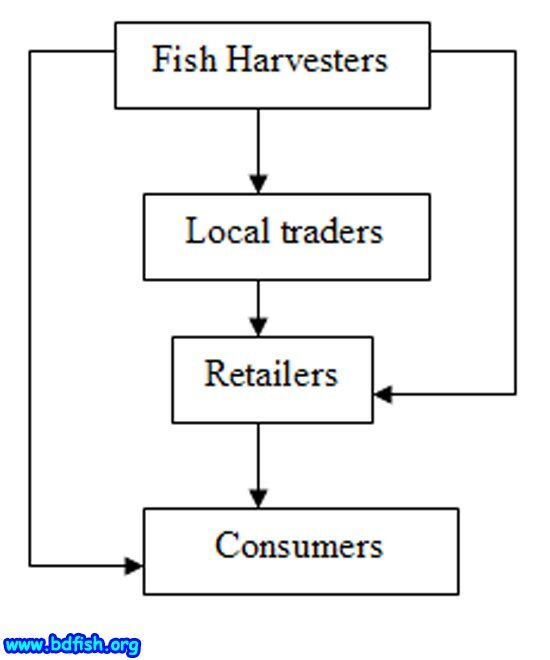 Livelihoods in Coastal Fishing Communities and the Marine Fish Marketing Systems of Bangladesh. NRI Report No. 2712, Natural Resources Institute (NRI), Greenwich University, London. Visited 5,483 times, 1 visits today | Have any fisheries relevant question? S/He published 11 features. View All.